Most renovations require the WORKS team to demolish something—a wonky floor, for example, outdated cabinets, and in this case, all or part of an entire room. 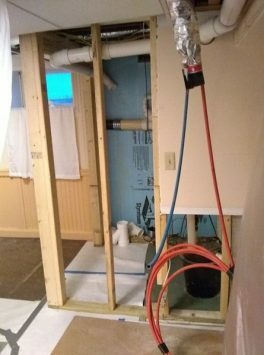 The photo shows a basement utility closet that will become a modern, convenient bathroom for a basement bedroom. Because the basement had been remade into a one-room accessory apartment sometime in the past, the bedroom and kitchen were in the same space and an uncomfortable bathroom was located out in the hall. The new owners wanted to replace the accessory apartment with a downstairs master bedroom and WORKS was happy to oblige. Our team understands construction, but we also understand deconstruction, especially in older and historic homes like those on the North Shore of Boston. We know that older homes may have odd electrical and plumbing arrangements and that materials (such as horsehair ceilings) may also be unusual. We know how the original structure of an old home can be hidden by years of changes and repairs, and we are happy to bring back the old bones stronger and more beautiful than ever. Whether your renovation requires stripping a room from floor to ceiling or reconfiguring a closet, WORKS by Jesse DeBenedictis has the range of expertise to help. For over a decade, we have completed restoration and renovation projects throughout the North Shore of Boston, including Amesbury, Beverly, Boxford, Charlestown, Danvers, Essex, Georgetown, Gloucester, Groveland, Hamilton, Ipswich, Lynn, Lynnfield, Rowley, Manchester-by-the-Sea, Marblehead, Middleton, Nahant, Newbury, Newburyport, North Reading, Peabody, Rockport, Salem, South Dartmouth, Swampscott, Topsfield, Wenham, Middleton, and West Newbury. South Dartmouth borders Buzzards Bay on the North Shore of Massachusetts. Despite its name (earned when some colonists mistook an osprey for a buzzard), Buzzards Bay provides glorious access to Rhode Island Sound and Cape Cod Bay. 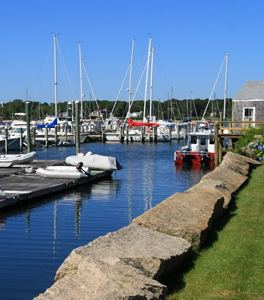 South Dartmouth is home to the New Bedford Yacht Club and the finish line for its annual regatta.